Dragonfly Sweetnest: Battle The Harsh Cold with Radical Skincare! Battle The Harsh Cold with Radical Skincare! With the weather being so cold these past few days, my biggest concern is having tight dry skin. I wanted to share with you one of my new favorite products that has been such a savior this week. Radical Skincare Peptide Infused Antioxidant Serum is the perfect addition to my morning and nighttime routine – I put this on before my moisturizer and it leaves my skin so soft and radiant. 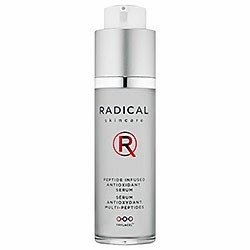 This serum protects, repairs and firms the skin and is a great shield against free radicals responsible for skin aging.